This update introduces a visually enhanced Replay experience. 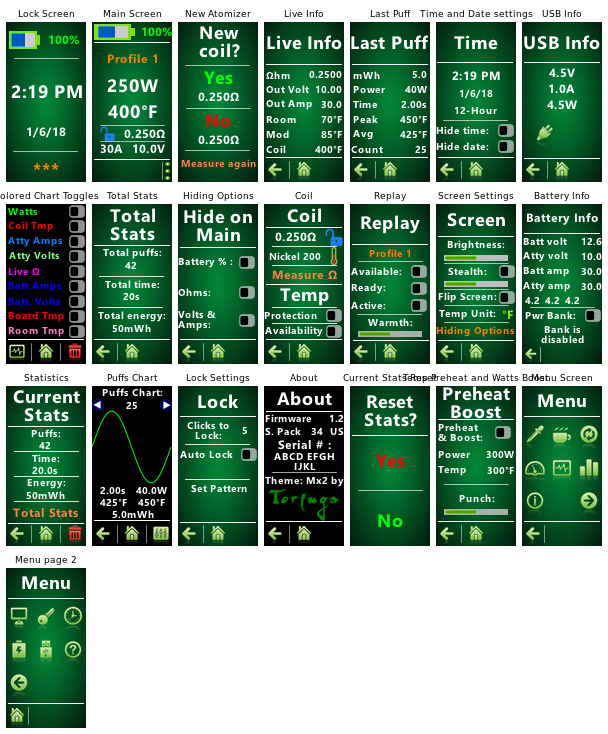 Puff Charts screen gives you the option to record 9 different type of data for your puffs. These 9 options are represented by the colors they have on the chart. No more guessing! Hide info is a new feature added in version 1.1. You can now hide the battery %, Ohms and Voltage with Amperage from the main screen. You can have the "clean" screen experience instead of the more technical one. When hiding "battery %", the battery icons will get bigger with more accurate representation. It's all about customization! All and all an advanced theme even a simple user can navigate. Try it out and let me know what you think in the comments and reviews. This update introduces a visually enhanced Replay experience! When Replay is activated, all unnecessary data will hide automatically. You now get a Replay icon that lets you know, Replay is on and running smoothly. Optimized for a better Replay experience! Previous "save" and "stop" icons bothered me as they had flashy colors AND were big. Overall i felt they were filling the screen with something we don't want to see too much of when we are vaping on Replay. Now they are new small icons that we are all familiar with! 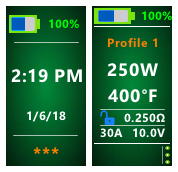 You can now hide the battery %, Ohms (and ohm lock), and Voltage with Amperage from the main screen. You can have the "clean" screen experience instead of the more technical one. When hiding "battery %", the battery icons will get bigger with more accurate representation. It's all about customization!